April 16th – Colin Boocock will deliver on an in depth look at the history, covering the whole of more than a century, of ‘Eastleigh Works’ (London & South Western, Southern and British Rail). Colin had personal involvement in the 50s and 60s. I have it on good authority (not from Colin) that this presentation ranks among the very best. May 21st – will see the return, following a long gap, of Ken Horan who has agreed to present ‘Around the World’ a collection of his own images. June 18th – Mike Brearley relates, on the story of the ‘Derailment, on May 18th 1948 of the St. Pancras to Bradford express at Manvers’. This presentation was put together to mark the 70th anniversary of the accident and included the contribution of two survivors both of whom he hopes to bring along with him. July 16th – A long overdue look at ‘Signalling’ by Peak Rail Signalling Engineer, Dominic Beglin. The first work I did when volunteering at Peak Rail was assisting with the installation of the Darley Dale to Rowsley South section under Mike Ball and Nigel Robinson. This is an area which has always held a fascination for me and, despite its essential nature on whatever type of railway seldom receives the coverage it warrants. August 20th – A slide presentation on ‘The Lynton and Barnstaple Railway’. This has, very rapidly and despite the distance from Sheffield, become a firm favourite with Ken Grainger. September 17th – A two-hour PowerPoint presentation by Glynn Waite of the Rowsley Association titled ‘Railways in and Around Chesterfield’. The last built line in Chesterfield was that of the Lancashire, Derbyshire and East Coast Railway with its Market Place terminal station alongside it’s Portland Hotel. After a very short independent existence the railway was taken over by the Great Central Railway which already had a presence in Town with the Central Station on the Chesterfield loop built as part of the Derbyshire Lines of the Manchester, Sheffield & Lincolnshire Railway. The first line opened in Chesterfield was the North Midland engineered by George Stephenson. The Brampton Branch, an industrial line serving various collieries, the gas works and other businesses, curved west from south of the station on the Midland line. Additionally, and within a five mile or so radius we had a large number of manufacturing industries plus a whole landscape of collieries. The lines have closed in reverse order of building, the Market Place line closing in the late 50s and Great Central in the mid-60s leaving the Midland as the sole survivor. Glynn has a wide variety of potential sources for an evening I am most certainly looking forward to. 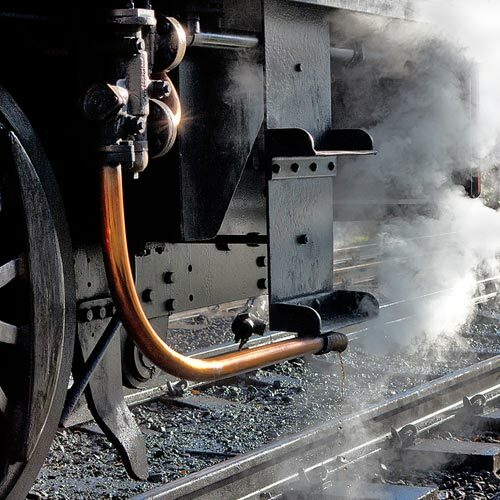 October 15th – Mike Fish has, over the years, visited and recorded steam in a wide diversity of countries. We have previously been in New Zealand, Japan and the USA with him – tonight we experience ‘The Hill Railways of India.’ The Darjeeling Himalayan Railway is the line which immediately springs to mind but two others, the Kalka-Simla and the Nilgiri Mountain Railways, have their own different and distinctive characters. December 17th – Our final presentation this year on will be ‘The Settle and Carlisle Railway’ described by Les Nixon as ‘A blow by blow survey of this popular line with around 20% of the photographs featuring ‘real steam”. The doors are now open from early afternoon and our meetings start at 7.30pm with any announcements, appeals etc before the first part of the evening’s presentation. After an hour or so we have a break while raffle tickets are sold, and the draw made following which we have the second half of the presentation ending the evening at about 10.00pm. 1) Parking at the premises is strictly limited but plentiful, unrestricted on-street parking in marked bays is available within 200 yards. 2) There are no catering facilities at the club – again food is available all day at ‘The Devonshire Arms’ some 200 yards away on the opposite side of Mansfield Road and ‘Andy’s Bistro’ about 250 yards away on the same side of Mansfield Road both away from Chesterfield.